Hardell, L, B van Bavel, G Lindström, M Carlberg, AC Dreifaldt, H Wijkström H Starkhammar, M Eriksson, A Hallquist and T Kolmert. 2003. Increased Concentrations of Polychlorinated Biphenyls, Hexachlorobenzene and Chlordanes in Mothers to Men with Testicular Cancer. Environmental Health Perspectives 111 doi:10.1289/ehp.5816. Hardell et al. report a strong association between testicular cancer risk for a man and the levels of organochlorines in his mother's serum. They found only a limited link between OCs in the man's own blood and the likelihood of developing testicular cancer. 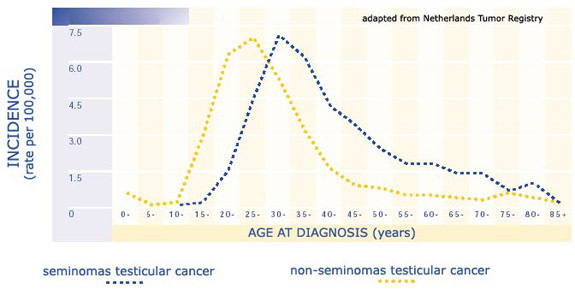 Although testicular cancer is a disease primarily of young adulthood (see figure, below), growing evidence points to developmental failure in the fetal testis as its principal origin. A number of factors have been suggested as possible causes of this developmental failure, including endocrine disrupting chemicals. The graph above shows the incidence rate of the two principal forms of testicular cancer as a function of age at diagnosis. Most cases are diagnosed in men between the ages of 20-35 years of age. While these data are from the Netherlands 1989-1996, they are typical for the pattern of testicular cancers around the world. No animal model for testicular cancer is currently known, however, and only limited epidemiological evidence links hormonal exposures in the womb to testicular cancer in humans. What did they do? Hardell et al. recruited men newly diagnosed with testicular cancer in several Swedish hospitals, along with their mothers, to participate in the study. Each man with testicular cancer was matched with a control (without testicular cancer) drawn from the Swedish population registry. To eliminate confounding variables associated with age, each patient/mother pair was matched with a control/mother pair in which the control and the control's mother were close in age (within 5 years) to the patient and mother to whom they were matched, respectively. Serum was obtained from each participant in the study and then analyzed for a series of organochlorine contaminants: 38 PCB congeners (summed), hexachlorobenzene (HCB), p,p'-DDE, and six chlordane congeners. Hardell et al. then calculated odds ratios for the risk of testicular cancer in relation to contamination levels, in both mothers and sons. What did they find? Hardell et al. analyzed the blood of 58 case-control pairs, 44 mothers of cases, and 45 mothers of controls. They found little difference between the contamination levels of the men with testicular cancer and their age-matched controls. Only one contaminant, a congener of chlordane (cis-nonachlordane) showed an elevated risk, with an odds ratio of 2.6. The 95% confidence interval for this odds ratio ranged from 1.2 to 5.7. Comparisons of the mothers yielded markedly different results. Highly significant differences (all p < 0.01) were observed comparing the concentrations of three of the organochlorine measurements in case mothers vs. control mothers: PCBs (summed, p = 0.0006); HCB (p = 0.005) and Cis-nonachlordane (p = .008). All chlordane congeners summed was marginally significant (p = .04). The odds ratios for four of the organochlorine measurements (bold in table below) were elevated substantially, with the lower limit of their 95% confidence intervals each exceeding 1. Table adapted from Hardell et al. In addition to displaying the odds ratio and 95% confidence intervals, this table shows the number of cases and controls which exceeded the median concentration level for each organochlorine measurement. For example, while only 20 of the controls exceeded the median value for summed PCBs, 34 of the men with testicular cancer did. What does it mean? Hardell et al. 's central findings are that (1) mothers with higher organochlorine levels are significantly more likely to have given birth to sons who develop testicular cancer; and (2) in contrast, the sons themselves for the most part do not have elevated organochlorine levels compared to men without testicular cancer. While this result falls short of proving that developmental disruption by organochlorine contamination in the womb sets the stage for testicular cancer in adulthood, it strengthens the case significantly. No other mechanism would be consistent with the the central findings of this study. What are the study's weaknesses? The sample size is relatively small. Nonetheless the results are highly significant. The study assumes that measurement of OCs in a mother's serum on average some 30 years after the son's birth provides useful information about exposure levels experienced in the womb. The studied organochlorines are highly persistent, lending some legitimacy to this assumption. If were not true, moreover, it is highly unlikely that results of the significance level reported here would be found. The study has no information about exposure to non-persistent endocrine disrupting compounds, for example phthalates, established by animal experiments to disrupt development of the fetal testis. Many if not all of the sons in this study were surely exposed transiently in the womb to some--possibly many--of these contaminants. But the presence of these other agents, if they too interfere with fetal testis development, would be more likely to increase the likelihood of false negatives rather than false positives. Hence the fact that the results are strongly significant even without controlling for other agents indicates that these results are real, not artifactual. This research also provides an important reminder that exposure measurements at the time of diagnosis of adult diseases are inappropriate for epidemiological studies in which risks are established during windows of vulnearbility early in life. Almost all the comparisons of organochlorine contamination of cases and controls in this study were nonsignificant. The one (cis-nonachlordane) that was positive has a modest elevation in risk (odds ratio = 2.6) but the confidence limits were broad.